F. Wesel Manufacturing Company was established in 1880 in Brooklyn by German immigrant Ferdinand Wesel (1846-1912). The company made a wide range of printing equipment products including quoins, type saws, galley presses, hand presses and proof presses. The latter may be the scarcest of their output today. Wesel’s 1894 Illustrated Catalogue shows three proof presses more advanced than those then built by Challenge Machinery—and even the earliest Vandercooks fifteen later. See the post Origin of the modern proof press reconsidered II. 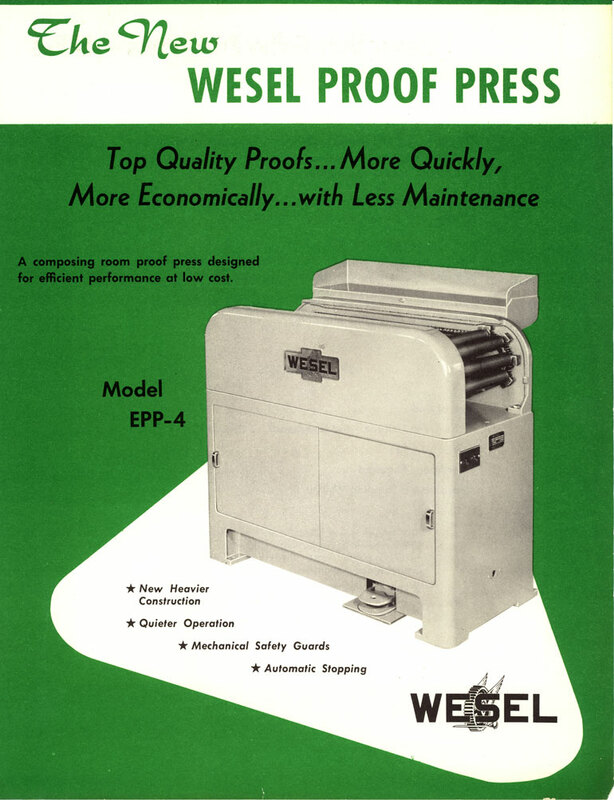 Later, they made an Electric Proof press, similar to the Vandercook 22 and 23 (and later HS-27). In the early 1960s the company began to design and manufacture special automated equipment. Today, the successor company, Wesel Manufacturing Co., designs and does full service contract manufacturing of metal parts, and complete assemblies including CNC machinery.